Take it from the talking doorknob Alice encountered in Wonderland, "One good turn deserves another." 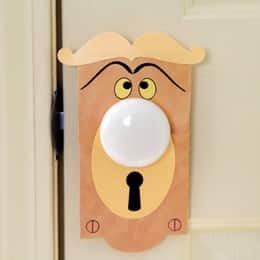 Made in the whimsical knob's likeness, this colorful paper doorknob plate is a handy prop for surprising your child and reciprocating for past April Fools' pranks! 2. Glue the keyhole plate to the doorknob plate, positioning it about 2 inches from the top and 1¼ inches from the bottom. 3. Place the doorknob plate template piece atop the assembled gold paper door plate and now follow the lines to cut out the center hole, as shown. 4. Fold back the side tab on the plate. Then glue the plate trim in place. 5. Glue on the keyhole "mouth," eyes, eyebrows, and screws. 6. Once you've chosen a doorknob to hang the plate on, gently separate the paper at the slit on the side and slide the plate onto the knob base. Then secure the tab to the back of the plate with a removable glue dot.